Economics is often accused of being "a-ethical" - lacking a moral perspective - if not altogether immoral. Its detractors criticize economic models of pure and perfect competition, and claim that economics should be concerned with social effects and strive to be equitable. Yet, these critics fail to understand that the discipline has many dimensions. Economics has also developed a group of concerns directly related to ethics. The presence of practical ethics is evident in the economic analysis of behaviour that incorporates ethical preference, altruism, and a responsible calculation based on norms. It is fair today that economics differentiates ethics from purely financial matters, and the discipline can be associated with morality in man's daily life. 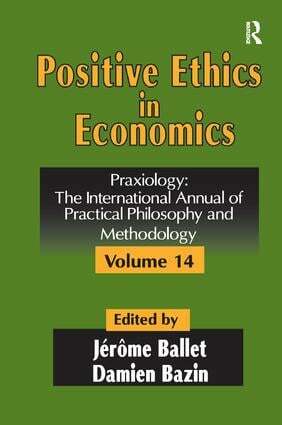 Volume 14 of the distinguished "Praxiology" series, examine the concept of positive ethics in economics. While normative ethics moralizes economics, trying to render it more "just," positive ethics is first and foremost a model for the construction of theoretical economic reasoning: it reflects on ethical practices within economics, and introduces a model of reasoning that takes individual ethical behaviour and its after-effects into account. The book is divided into three parts. In "Altruism," the contributors discuss the notion of unselfish concern for the welfare of others, and its place in economic practice. In "Commitment," the authors discuss reason as being central to economic theory, as well as the position of ethical behaviour. In "Responsibility," the idea that man is not an island unto himself, but a being involved in a set of relationships, is examined. If a person is simultaneously responsible for himself and others, then how far does his responsibility extend? "Essays on Positive Ethics in Economics" is thought-provoking volume that will be of interest to economists, policymakers, philosophers, and students of ethics and morality.